Click HERE for Pattern Part 1. Click HERE for Pattern Part 2. Read all instructions carefully before starting. Cut body of light blue felt, heart and bow strip of dark red, wings of antique white and head of flesh felt. With 2 strands of gold floss work small blanket stitches across the top of the pocket. Place heart at the center of the pocket and using 1 strand of dark red floss slip stitch heart in place. Place flesh head over blue body front. Pin in place and slip stitch at neck with flesh thread, 1 strand. Place body front and back together and pin together. Using 2 strands of flesh floss work small blanket stitches around head from one neck point to the other through all thicknesses. Place pocket at lower body of angel front. Pin in place. Working through all thickness and using 2 strands blue floss, beginning at neck work blanket stitch around to within 1 1/2" of neck, leave opening. Secure thread. Using a dotter dipped in black acrylic paint dot eyes and let dry. Highlight each eye dipping dotter into white acrylic paint and dotting to one side of each eye. Let dry. Using 01 black pigma micron marker make nose, lashes and eyebrows. Felt is fuzzy, therefore, work carefully with your marker. Make a swish for mouth with the red paint and a liner brush. Let dry. Blush Cheeks. See pattern piece. Tie bow of dark red and trim ends. Hot glue bow at center neck. Hot glue liberty bell at bow center. Work small blanket stitches of 2 strands gold floss around wings. Hot glue wings to back of angel at neck. With remaining gold floss wrap around 3 fingers 8 times. Tie in the middle. Fold over and hot glue at top of angel head for hair. Tie a bow using two pieces of gold floss. Hot glue to heart top, just to one side. Hot glue button to bow center. Thread hanger can be attached to top center back of head, if desired. 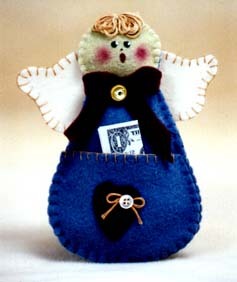 Tuck your special gift or treat into angel's pocket and share with a friend or someone special. For the decorative finish along the edge of the ornaments, use a blanket stitch using two strands of embroidery floss. Beginning on the underneath side, come up to the right side of the work. Work the stitches about 1/4" apart and in depth as you work all the way around to your beginning point. Remember to leave an opening for stuffing. With right side of the fabric up, working from left to right, with the right side of the edge toward you, hold the thread with the thumb and insert the needle from the right side, catching the top edge of the piece you are working with, then bring it out from under the edge and over the thread. Draw the thread through by pulling it toward you forming the blanket stitch. Do not pull the thread too tightly. Formerly Hickory Stick & Co.
RiverTown Warehouse has an array of patterns and kits covering crafts like this little angel (kit #R-314 $6.00 plus P & H) There are also a Girl Angel, Santa, Snowman, Kitty and Doggy with the Angel Bear in a pattern pack (Gift Givers ornament #R-262 for $7.00 +P&H) or the same designs in a kit (#R-282 for $17.00 + P&H). The kits and patterns show a variety of Christmas themes in felt, some with added wooden pieces and other decorations to turn your home into a winter wonderland. RiverTown also has several "Critters", a Flip Me Over Doll ( patterns average price $7.00 + P&H each) Kits vary depending on contents.